Leading Manufacturer of net with heavy embroidery party wear sarees, rich looking party wear designer sarees, georgette net party wear designer sarees, delight party wear designer sarees, bollywood party wear designer sarees and artistic party wear designer sarees from Chennai. Our organization offers an Net With Havy Embroidery Party Wear Sarees The offered designer sarees are manufactured by making use of finest quality silk and designed with attractive patterns, that are prominently in the fashion. Having a renowned name in fashion industry, we are involved in offering an extensive range of Fancy Designer Sarees. With elegant designs and royal look, the product is in demand across the market. Lovely colors and irresistible laces are some of the features which make it a rare collection. ufacturing, supplying, trading and wholesaling of a wide range of Fancy Designer Sarees. Our offered range is designed by experienced professionals using excellent quality fabric. Our cost effective and aesthetic range of Party wear sarees are popular among our countless customers. Apart from exclusive designs, the dazzling colors of these sarees are highly appraised by our customers. These sarees are available in eye-pleasing patterns and attractive looks. We are offering very fine quality Designer Sarees to our most reliable customers. These Sarees are available in various designer and attractive patterns which enhances the beauty of every lady who wears it. These can be custom manufactured to meet the requirement of our clients from any part of the world. We are Offering an entire range of Fancy Printed Designer Sarees. Available in various designs & color combinations, these sarees are ideal to be worn at different occasions. Usage of high quality raw material supplied by our reputed vendors enhances the durability of the the product. The offered sarees are worn by ladies occasionally to the parties, festivals and functions. These sarees are designed with the help of finest quality fabric and advanced tools in compliance with set industrial norms at our vendors' end. Our clients can demand from us a well-stitched range of Designer Sarees, each one crafted with utmost finesses. We have experts from the industry at our premises who procure finest quality silk and other fabrics, so that the quality of the product is flawless. These party wear saree are made from high quality of raw material which ensure durability at its user end. These party wear saree are appreciated by large number of clients. These products are available in market at economical rates. 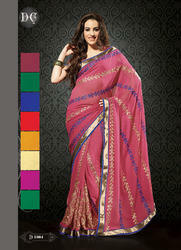 designed to dazzle these sarees are available in an array of high quality fabrics and color combinations. Looking for “Embroidered Lehenga Sarees”?